As I recall a garden with special meaning to me, I think first of the gardeners. My late paternal grandparents, Milton and Myrtle Pyle of Geneva, IA were truly Master Gardeners, though no horticultural society existed to certify their expertise in the late Fifties. A full third of their lot, from the back fence clear to the street, was taken over by a garden–its careful tilling and tending elevated to an art form. In early May the strawberries, rhubarb, lettuce, peas and onions came on, giving way to the late summer crops of carrots, beans, tomatoes, potatoes, watermelon, squash and sweet corn. Fruit trees and raspberry bushes flourished behind the garage. Grandma Pyle, a study soul in a fragile body, spent the summer months canning over a hot stove. Grandpa did the weeding, picking and shucking. They always planted together. Bordering the garden and interspersed with the vegetables were flowers: roses; gladioli (the” glads,” we called them); zinnias; phlox; and tiger and day lilies. The thought, gardening hands are praying hands, came to mind as I watched them work together when I visited on weekday mornings. Those same hands were folded in prayer before simple, delicious meals made from the day’s pickings. After lunch, I would scurry on over to the town baseball field on the adjacent lot. I liked to sit on the bleachers, listening to the wind whistling through large pines, and watch my grandparents contentedly working away. In retrospect, they might have appreciated my help; if I had tagged along, I might have taken up gardening. I preferred to behold my grandparents in their element, knowing even then, that I would rather be a cultivator of words and would write about them one day. STORY CIRCLE PROMPT: Remember a special garden. Write a journal reflection on a garden that held meaning for you. Why was it special? Did you plant it or tend it? What did it teach you? 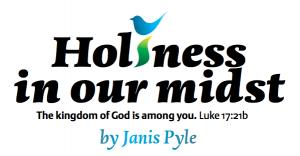 Holiness in Our Midst: Sharing Our Stories to Encourage and Heal is a monthly online feature created by Janis Pyle to facilitate sharing of our personal experiences, thoughts, beliefs, and spiritual practices with one another, especially through stories. Barriers are broken down when we begin to see all persons, even those with whom we disagree ideologically, as sacred and constantly attended to by a loving Creator. Each column is accompanied by a “story circle” prompt and study guides for personal and group reflection. To share your stories, contact Brian Gumm at communications@nplains.org. Janis Pyle can be reached at janispyle@yahoo.com.